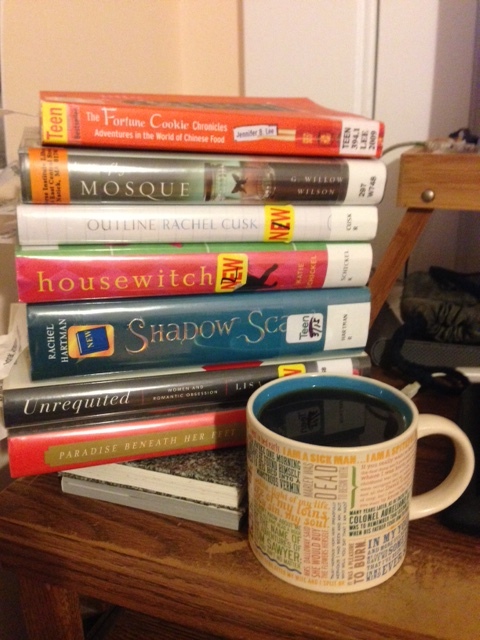 That phrase – when it rains, it pours – well, that’s this week for me in library haul. I’ve had a bunch of books on hold for a long time, and some books I just put on hold this week, and all of a sudden, they were all heading to me. Seven of them (pictured) arrived by the time we had our weekly library run this weekend. More are on their way. Considering that four of the seven and several of those in transit are nonfiction, there is no way I’m going to get through all of these by the time they’re due. Though thankfully, my library for some reason checked them out to me until mid-April instead of the standard three weeks, so I have slightly more time. Still, even if I don’t get through them all, I’m grateful to have them. My access to physical books has been sparse the last few weeks (did I mention some of these have been on hold for a long time?) and I’m looking forward to having plenty of books on hand for awhile! I just picked up holds yesterday and of course four had come in at once. On top of a very large pile that I already had checked out 🙂 I hope you do get to enjoy the majority of these! I wish, so much, that I was a library person. My one bad experience as a kid managed to completely turn me off. A few years ago I tried to go back, but it didn’t take. Maybe I can make the library one of my goals next year. OK, you’ve got me so curious—would you be willing to share what happened? Some libraries just aren’t great. I’m grateful that my library in San Antonio was so awesome because that’s when I really started using one and I know I couldn’t afford to buy all the books I want to try, haha! I have quite a few from the library at the moment, too… I took a break from the physical library books after I got my Kindle, but I’ve been enjoying switching it up between physical and e-books lately. I just hope I don’t get so overwhelmed that I take them off my TBR just to ease the pressure! Clearly the librarians looked at that stack and thought, “This girl needs more time.” I wish my librarians thought that way! I am not familiar with any of the books in your stack so I hope you tell me how they are! Yeah I have no idea why the due dates are all wonky. They apparently recognize my youngest son as “that kid who always orders dozens of mangas” though, haha! Hi – we were emailing before your move… sorry that it seems like you aren’t loving the Boston area. Have you checked out the Wellesley library too? I love it there. I haven’t. The only place I’ve been in the Newton library that’s within walking distance. I don’t really drive much!